DOWNTIME: Varma and Agarwala take a break. Imagine that you’ve quit your high-paying job with a big, prestigious firm to launch a financial advisory service tailored for India’s rapidly growing middle class, and one of your first customers, a 60-year-old retiree, nails you with a stinging rebuke. Such was the investment climate in India during the spring of 2007 as Dhruv Agarwala and Kartik Varma (both MBA ’02) attempted to get their start-up, called iTrust Financial Advisors, off the ground. The Indian stock market was booming, and investors had grown accustomed to outsized returns. Then the bottom fell out. The financial crisis spawned in the United States reverberated around the globe during the summer and fall of 2008, and iTrust’s fledgling customer base pivoted from unrealistic expectations to sitting on the sidelines afraid to invest, period. To make matters worse, staffing their start-up turned out to be painfully difficult. It didn’t help that the free office the partners secured from a friend for a year was located in a gritty New Delhi suburban industrial park with a waste facility across the road. Noxious fumes emanated from a second-floor manufacturing business and drifted into iTrust’s third-floor offices, reached only by walking up a winding staircase, framed by walls with peeling paint and cobwebs. Nothing in their polished business plan prepared the partners for the reality they faced from Day One. The friendship that blossomed into a partnership that became iTrust dates from a chance encounter in front of Burden Hall during orientation for the January 2001 cohort. That’s where Agarwala and Varma first met. “We stayed in contact as friends over the next two years, but there was no talk of starting a business,” recalls Agarwala. He and Varma arrived on campus with widely divergent backgrounds and interests that later proved complementary when it came to carving up iTrust management responsibilities. Agarwala grew up in Calcutta, the original capital of India during British colonial rule, dreaming of playing cricket. He ultimately decided to study engineering in the United States, earning a B.S. in materials science from Northwestern and an M.S. from Stanford. After graduation, Agarwala returned to India, where in 1996 he started a successful iron-ore mining company and later founded a Calcutta-based management training school. Varma grew up in New Delhi and attended Delhi University, where he was so bored with the antiquated course offerings that he spent much of his time at Stagedoor, India’s largest professional theater company. There he acted in eleven plays and frequently served as production manager. Following in his father’s professional footsteps, he went on to earn a law degree from the London School of Economics but decided to forsake the predictable routine of law and work as an investment analyst in London and on Wall Street. At HBS, Varma pursued his dream of becoming the business manager of a Formula One racing team, an unusual quest that inspired an HBS case, “Vikram Singh’s Job Search.” While the case disguised his name, it otherwise stuck to the biographical facts. According to its author, former HBS faculty member Monica Higgins, the aim of the case is “to ask what is risky, and when should one embrace one’s passions” versus taking the “easy” option of returning to the familiar. Rejected by every Formula One team he pursued, Varma chose the “familiar” option after HBS and initially returned to work in London with Ziff Brothers Investments before joining one of Europe’s leading hedge funds, The Children’s Investment Fund (TCI). Meanwhile, Agarwala accepted an offer from General Electric and held various senior management roles in the United States before moving to India in early 2005, where he became CEO of GE India’s infrastructure business. Although the two stayed in touch after HBS, three years passed before their first conversation about starting a business in India. By late 2005, both were restless and interested in exploring opportunities there. Agarwala was ready to make the leap when the two met that November at a Starbucks near Crotonville, New York, where he was attending a GE training program. He recalls prodding Varma to make up his mind: “You’ve been away from India for over fourteen years, and unless you spend some time there to understand the environment, you won’t get an understanding of the opportunity or know if you really want to work there.” Within two weeks, Varma boarded a plane for New Delhi, where the two resolved to become partners. Agarwala left GE in May 2006, and by August, after weeks of brainstorming, they finally settled on a financial services advisory business. Meanwhile, Varma left TCI and moved to New Delhi in late November. It’s not hard to understand why Agarwala and Varma staked their claim to financial services advice. India has a rapidly growing middle class that is “clueless about what to do with their money because their parents’ generation never really had family wealth,” explains Varma. Those who did typically bought gold. iTrust estimates that the country has 20 million affluent households, growing at 15 percent per year, with an annual income of $10,000 to $60,000. While deregulation in recent years had created an explosion in financial products to choose from, distribution remained a problem — no one had yet created a one-stop shop to get advice, buy products, and manage finances. Enter iTrust with a range of services covering mortgages, mutual funds and other investments, insurance, and tax and financial planning. From the outset, the partners aimed to distinguish iTrust from a multitude of financial product providers — banks, mutual funds, and insurance companies — in two key ways. Rather than open a high-cost retail branch network and wait for customers to walk in, iTrust has forged partnerships with 130 large and midsized companies across India to become a preferred vendor of financial services to their over 250,000 employee base. The companies provide free office space where iTrust “relationship managers” meet with employees. The arrangement gives iTrust, starting with zero brand recognition, “instant credibility in the eyes of company employees and a ready-made pool of customers,” says Varma. While similar arrangements are common in the United States, “no other company in India is working on this model, and it represents a huge channel innovation,” he explains. To hone iTrust’s credentials as a thought leader in financial advice, the firm quickly developed a formidable media presence. While Varma takes the lead, both partners write personal finance columns for Reuters’ India Web site and for the Wall Street Journal’s Indian partner, livemint.com. They appear on two TV shows every weekend: Bloomberg UTV’s Smart Money and ET Now’s Investor’s Guide. They also contribute to other mainstream and industry publications, mail an educational e-newsletter to 45,000 recipients each week, and produce self-help videos for their own YouTube channel (www.youtube.com/itrustmoneycast). The firm has also taken a leadership role in developing educational programs for India’s fast-growing female workforce, a nascent demographic shift similar to that experienced in Western societies over the past forty years. “Women historically have relied on their fathers or spouses for financial security, but that’s changing,” explains Varma. “Today, women are staying single longer, divorce rates are up, and more women want financial independence and control.” The response to iTrust’s financial planning seminars for women has been “overwhelming” and bodes well for the future “because women are more open to and are more likely to adopt a financial planning service,” says Agarwala. With a clear sense of the opportunity at hand and a well-crafted plan to capitalize on it, iTrust slowly assembled a core management team during its inaugural year and, with relief, graduated from its free, but shabby, space to a modern office complex in Gurgaon, a booming suburb southwest of New Delhi. Today, the company employs 150 people and has opened satellite offices in Mumbai, Bangalore, Hyderabad, and Chennai to serve a client roster of more than 40,000 employees from among its growing list of corporate clients. 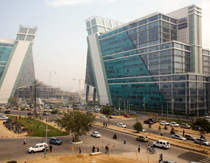 INDIA RISING: iTrust’s corporate office is in the booming Gurgaon suburb of New Delhi. 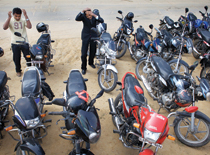 Many workers arrive by motorcycle, a popular form of transportation. Inside, an iTrust relationship manager coaches a new financial adviser. While having a plan is essential, execution is the truly hard part. “India has certain quirks,” Varma laconically observes. The World Bank’s annual report on global business regulation, Doing Business 2010, ranks India 133 out of 183 nations in regulations that enhance or constrain business activity. By contrast, neighboring Pakistan ranks 85, and China ranks 89. India’s dismal ranking isn’t lost on Agarwala and Varma. Knowing that their frustrations are the rule, not the exception, iTrust cosponsored the launch last summer of an online petition drive (www.e2i2.in) to urge the prime minister and other policymakers to remove regulatory barriers that entangle Indian start-ups. Nor are angel investors, wealthy individuals who back start-ups, a reliable option, adds Khanna. Unlike in the United States, where angels form clubs in major cities and hold regular meetings to screen investment prospects, India has few such active networks. It’s not surprising then that 85 percent of the capital raised by Agarwala and Varma — they are not at liberty to disclose the amount — came from foreign investors, about a third from HBS alumni and professors. They had the good fortune to complete fundraising before the global financial crisis hit, and their investors understand that “it takes time to build a personal finance business,” adds Varma. Under no circumstance will iTrust give any of its customers a kickback or a rebate. While this practice is common in the financial services industry, it is illegal. iTrust hopes that, as a new generation financial services company, it can influence progress in the industry. In a blog post, Varma observes that it would have helped if someone had passed along a list of quirks unique to India before iTrust launched. “It would have saved a lot of time and emotional energy,” he writes. On the technology front, a first-rate in-house IT team built the company’s Web site and stocked it with self-help financial product information written by Agarwala and Varma, developed proprietary financial planning software, and set up an online tax filing system that quickly made iTrust a leading tax preparation service. Offline, Agarwala and Varma steered development of an intensive staff training program. The typical iTrust relationship manager is a 25-year-old male with a university degree who has worked for two or three years with a bank or insurance company where the job required him to cold-call prospects and push products. iTrust takes a different approach. New hires unlearn how to be “product pushers” and learn instead how to be customer-oriented advisers. The training program includes a set of metrics that relationship managers must hit in the first thirty, sixty, and ninety days. “We track performance against those measures and have area managers coach staff to make necessary improvements,” Agarwala explains. With their hybrid distribution and sales model now finely tuned, the partners believe they have laid a solid foundation from which to “catch the next wave when the markets again rise,” signs of which are already emerging. 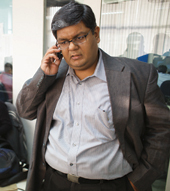 ALL IN A DAY’S WORK: Agarwala takes a call at the iTrust Gurgaon office. In the background, members of the sales staff, who typically visit the office at least once a day, prepare client proposals. 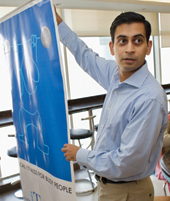 Varma sets up an iTrust poster in the cafeteria of a corporate partner. 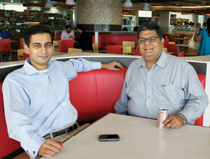 Building a company from scratch can be a lonely endeavor, but Agarwala and Varma have lots of entrepreneurial company. Historically, most Indians educated in the United States chose to remain to pursue their careers. But now the majority return home, lured by economic opportunity that didn’t exist even a decade ago, says Vivek Wadhwa, a senior research associate at Harvard Law School’s Labor and Worklife Program. He estimates that about 100,000 “returnees” and their families will move from the United States to India in the next five years, and he sees a similar trend among Chinese graduates of U.S. universities. “Sure, things are tough in India and China, and entrepreneurs run into all sorts of problems,” says Wadhwa. “But the fact that these people can go back home, build a business, and live well was just unimaginable until recently.” In fact, the change in opportunity and aspirations has been so sudden that people in the United States “just aren’t aware that this has happened,” he adds.